Upper Deck has always been at the forefront of bringing new and innovative experiences to continually push the envelope of the card collecting for their fans around the world. 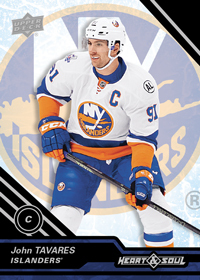 Once again Upper Deck delivers with the launch of its newest e-Pack exclusive product 2016-17 Upper Deck NHL® Compendium! 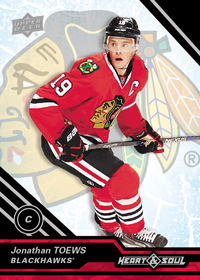 To date this will be the single largest product launch Upper Deck has ever done with an enormous 900-card base set! 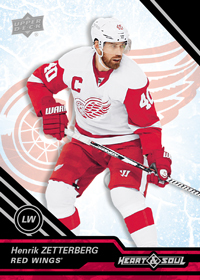 With that many base cards you can be assured that card will feature some familiar faces that represent the greatest in the history of the game, including the likes of Jaromir Jagr, Alexander Ovechkin and Wayne Gretzky! 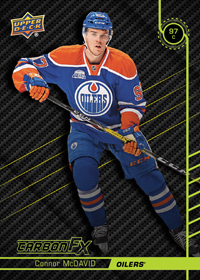 Included in these sets are some of the hottest young stars to lace up their skates and play such as Patrick Laine, Auston Matthews and Connor McDavid! You can also look forward to randomly packed inserts such as Magenta parallel cards, Net Destroyers and Carbon F/X. 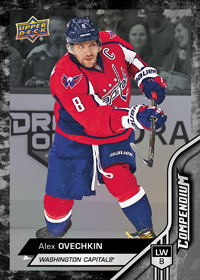 All new cards introduced for the launch of 2016-17 Upper Deck NHL® Compendium! 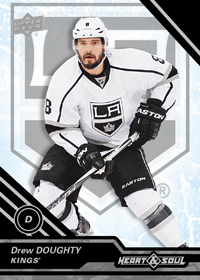 “Never before have hockey fans had such a comprehensive trading card set to collect like they have with 2016-17 Upper Deck NHL® Compendium,” said Ben Swiderski who spearheads many of Upper Deck’s e-Pack programs. “Compendium will deploy in three different series throughout this season with 300 cards per release. 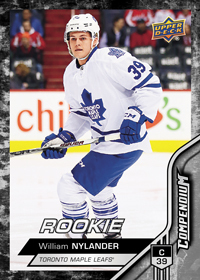 Some of the players featured will have their first-ever Upper Deck trading card in the set. 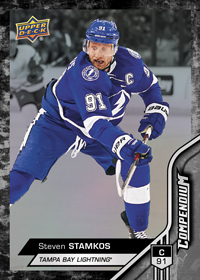 On Upper Deck e-Pack you can COMBINE 10 copies of any individual 2016-17 Upper Deck NHL® Compendium digital base to create a blue parallel physical card of that same base card. You can actually further evolve the blue parallel cards by combining five copies of that card and turn it into into the red parallel of that card. Combining five copies of the red parallel card will yield you a gold parallel version of the same card. 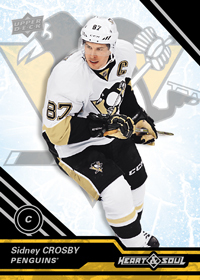 The gold version will be the most limited version of the Compendium cards. 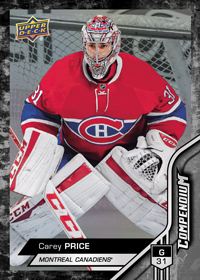 To further encourage collectors 2016-17 Upper Deck NHL® Compendium offers achievement cards for e-Pack users who meet certain criteria in collecting the set. 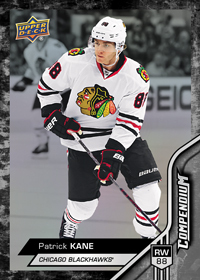 Collectors can earn rare achievement cards by completing entire sets of base cards at any level. 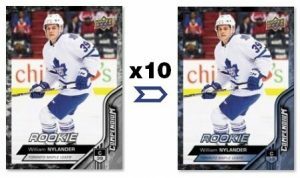 Users can receive up to a total of seven BASE SET SP ACHIEVEMENT CARDS by completing an entire set of the three releases. The cards awarded will correspond to the same color level that was achieved by the end of the time allotted. For those who complete an entire base set of cards #1-#300 will receive the first two of seven SP Achievement cards added to their collections. 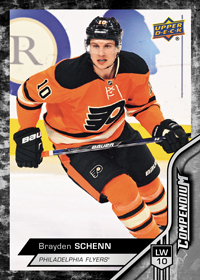 Those who complete an entire base set of cards #301-#600 will receive the next two cards of a seven card set of SP Achievement cards added to their collection. 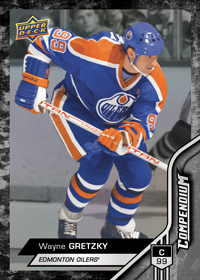 Those who complete an entire base set of cards #601-#900 will receive the next two cards of a seven card set of SP Achievement cards added to their collection. As the final reward for a collectors’ hard work and efforts, if they manage to attain all 6 SP Achievement cards in any color parallel level then they will receive the 7th and final SP Achievement card that corresponds to the parallel version of the completed set (regular, red, blue, gold, or magenta). 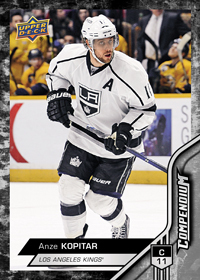 Within 2016-17 Upper Deck NHL ® Compendium you can look for insert cards such as the Magenta Parallels, Net Destroyers and Carbon F/X cards. Each one of these cards has its own achievement attached to it as well. So if collecting the base set doesn’t tickle your fancy, you have another route to go. 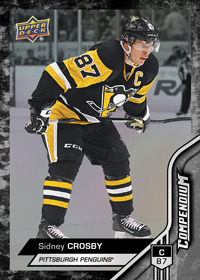 These cards will be divided up in the three releases of 2016-17 Upper Deck NHL® Compendium. 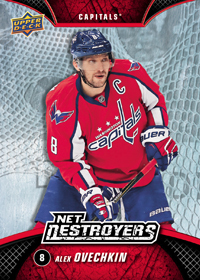 Completing an entire set of Net Destroyers inserts will earn you the first card of possibly seven HEART & SOUL Achievement cards. Completing an entire set of CARBON F/X inserts will earn you the second card of possibly seven HEART & SOUL Achievement cards. Completing an entire set of two digital inserts featured in Series 2 of Compendium will earn you the third and fourth card of possibly seven HEART & SOUL Achievement cards. Completing an entire set of the two digital inserts featured in Series 3 of Compendium will earn you the fifth and sixth card of possibly seven HEART & SOUL Achievement cards. 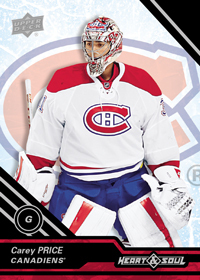 For those collectors who are able to stay dedicated and collect all the necessary insert cards through all three releases of 2016-17 Upper Deck NHL® Compendium will receive the seventh HEART AND SOUL Achievement card. For those who wish to reach for the very top in what they can achieve, COMPENDIUM offers a few more achievements that are sure to drive any serious collector forward. 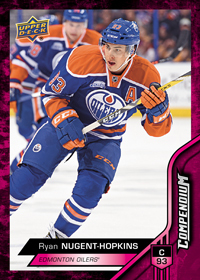 Those collectors who acquire enough cards to complete an SP Achievement MAGENTA parallel #7 card will then be eligible to receive one of four randomly awarded AUTOGRAPHED MAGENTA PARALLEL RC card! 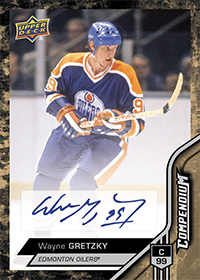 Those collectors who can complete an entire six card SP Achievement GOLD set will receive an autographed gold parallel card of the “Great One” Wayne Gretzky. 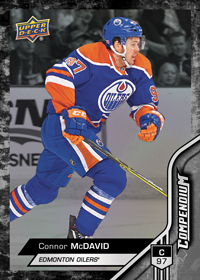 2016-17 Upper Deck NHL® Compendium promises to be a fun and exciting new product for collectors of all ages and levels. An entry level product with limitless possibilities, it’s sure to be a quick favorite of e-Pack users and collectors alike. 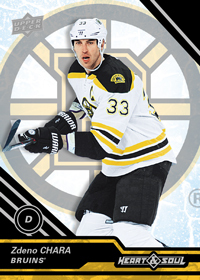 Upper Deck e-Pack™ is free to sign up and you can register today HERE. Make sure to log in every day for your FREE daily packs!